I recently connected with Chalkup to talk about classroom technology and how I’ve seen digital portfolios win in classrooms. Big picture, what’s your philosophy on classroom technology? Classroom technology, especially mobile and cloud-based, is still in its infancy. It seems like these devices and apps have been around for a long time, but it really has been only a couple of years. So, my philosophy right now is to select one or two things to try regarding technology integration in classrooms, and then do it really well. Introduce it to students, provide lots of modeling and guidance, share your celebrations and frustrations with colleagues, and then reflect on and refine your practice. With everything being so new, just trying something out and modeling the innovation process is a benefit not only to you, but everyone around you and connected with you. They learn from your learning. How does collaboration play a role in integrating classroom technology? Collaboration is critical. It is not feasible to have one or two technology experts in a school to solve all of the technology integration issues that come up. Schools have to build “techpertise” within everyone in the building. When the technology fails (and it will), who can I count on to help me in a pinch? Knowing who those go-to people are and how they can help you is a much more reliable model of technology support than the old system of calling the tech cadre when things go south. Explain what digital portfolios are and how they benefit learning. 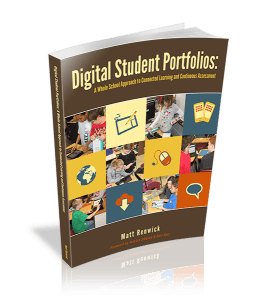 I define digital portfolios as online compilations of learning artifacts that allow students to represent their learning and reflect on their knowledge, skills, and dispositions in unique and differentiated ways. Whew – a long definition! Here’s a concrete example: Think about a paper and pencil test you might have just given in class. Did it give each and every child in your room reasonable access to show what they know and are able to do? If not, then we need to rethink how that assessment could allow for all of our students to be successful. A digital portfolio can facilitate and house a variety of ways for learning to be assessed. Instead of the paper and pencil test, could you record a student speaking the answers? This might not only help that student have equal access to conveying their understanding, it might actually augment the assessment process for you, the teacher, such as having no paperwork to take home. In addition, parents can also hear their child’s learning if it is shared with them through the portfolio tool, such as Evernote or FreshGrade. Rethinking how assessments are administered can have multiple benefits for those involved. How were you first introduced to digital portfolios? What’s been your biggest success using these products in the classroom? Our staff knew technology was coming, and we wanted to integrate these tools with thougtfulness and purpose. I learned about digital portfolios in the excellent ASCD resource Curriculum 21: Essential Education for a Changing World (2010), edited by Heidi Hayes Jacobs. After reading the related chapter by David Niguidula, a pioneer in digital portfolios, I felt like this approach to technology integration was both doable and had the potential of making a powerful impact on student learning. Our biggest success has been viewing them as products, and not the reason we are using them. As an elementary principal, could you tell us how digital portfolios – or other tools – help keep your school connected? Communication is the key to building trust and developing relationships. I’ve never had a parent complain that the school is communicating too much, especially the good stuff. When the school shares student learning on a regular basis via social media, digital portfolios, and other electronic means, families can see it taking place in real time. They don’t have to wait for conferences or portfolio night. Using the tools that parents are already familiar with, such as on smartphones as well as in print, honors all preferred methods of communication. As long as we follow privacy procedures for sharing information, being connected is a win-win for everyone. What would be one tip for teachers integrating technology for the first time? Share your learning journey with your students. This might be the first time in the history of education where the student have just as much access to essential knowledge and skills as the teacher. Use this to your advantage. Allow kids to be the drivers of learning in your classrooms, instead of just the recipients. They will surprise you with their intuition and creativity. Just as important, move yourself to the side of the assessment process, acting more as a coach instead of the “expert” in the classroom. School is more fun when everyone is a learner.